You are here: Home / Whatever Else / Family / He’s a spoiled brat – and I’m proud of it! Yes, I’m talking about my almost 9 year old son here – the one who walked into a hospital room to visit a sick family member, only to have another person in the room comment on his shoes. “Look at those fancy shoes! You must be a spoiled brat for your Mom to buy those for you,” Anonymous Rude Person said with a pointed glance at me. Once we left ARP’s presence, The Boy and I had a nice little talk about how people who feel bad, act bad, and how ARP must feel terrible inside to be unkind. And then I explained that he no longer had to worry about the conversation, that it was ok to let it go…and he has. I thought I had let it go, too, until late last week. That’s when I found myself pausing in my work day to take 5 minutes to load bread ingredients in the breadmaker, because The Boy wanted soup and bread for supper. Now, I had store-bought bread here. I had crackers on hand. He would have willingly and thankfully eaten either of those with his soup. But he loves my homemade rolls. And so I clocked it…5 minutes to put the ingredients in the bread machine. 6.5 minutes to pull the dough out, shape it into rolls, and set it to raise. 30 seconds to place the rolls in the oven, including time to grab the potholders. The same to take them out. 12.5 minutes out of my day, to make his favorite bread, a tasty treat to go with one of his favorite soups. And I realized how many times I do something like that for him…the 10 seconds to toss his jammies into the dryer on a cold night, the times I prepare rice instead of potatoes when he’s craving rice, the times I buy the inexpensive-but-awesome shoes instead of the inexpensive-but-plain shoes. The times I help him pick up his room, the times I go in and turn on the water for his shower to get it “just right”, the times where I set aside my knitting or my book because he wants to tell me for the ten millionth time about his latest screenplay he’s working on, or his latest Lego project, or the latest Doctor Who episode. There are so many times where I choose a different path than the one I walked as a child, times when I shut out the voices echoing from all of the sermons and parenting books of the past. Those voices tell me that I’m raising a spoiled brat – that I’m catering to him, that I’m letting him rule the roost, that he’ll turn into a delinquent or a gang member, that I’m setting him up for a lifetime of godless anarchy. It’s hard to shut those out, even almost 9 years into parenting this most awesome of awesome children. 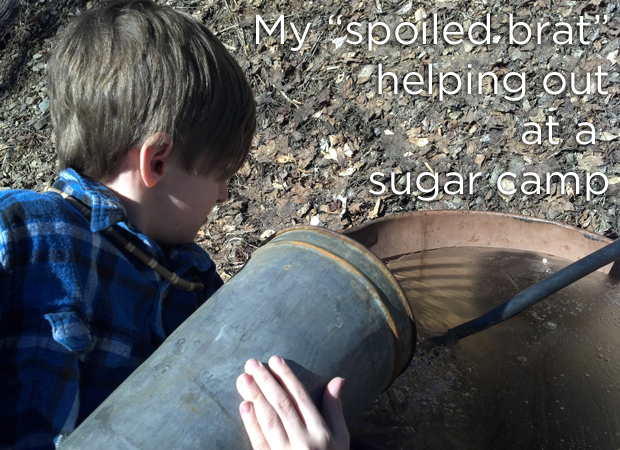 But it gets easier each time I see him interact with the world around him – because contrary to all of those who told me that treating my son as I’d want to be treated would ruin him forever, I’m seeing the benefits of raising a “spoiled” child. My child is generous with his money – we’ve had to institute an “ask Mom and Dad before you give” policy, because even though he understands the value of money, he wants to share equally with those around him, even those who have enough money of their own. My child is loving – he will sit and listen to anyone talk about problems they have, and always ask, “is there anything I can do to help?” and then do whatever it takes to help them, to the best of his ability. My child does his best to spoil others – he brings coffee in bed to his Dad (“Mom, I can’t figure out your French Press, and I know you won’t drink dripped coffee. But here’s a glass of water!”), he always holds doors for other to enter first, he offers to carry packages for strangers, he picks up litter and never ever leaves the grocery store without dropping in change for the food bank. He gives away toys and clothes, he notices things people like and then does those things for them. He’s also an almost-9-year-old boy, don’t misunderstand me. He isn’t always a paragon of virtue, and he has his maddening moments, his moments of immaturity, just like we all do. But I look at him, this child that I’ve decided to “spoil” by simply treating him like a human being that I love, and I marvel at the difference it makes. His generosity and openness humble and teach me, and I believe it’s because I’m reaping the benefits of his dad and I doing our (human, limited) best to make sure that his needs are met. He has no reason to withhold good from anyone, no concept of “teaching them a lesson” or “punishing” or refusing to be kind to someone while telling himself that he’s doing it for their moral development.